The Housing "Embalse de Alcántara" is near the edge of the waters of the Reservoir of Alcántara, formed by the river Tajo, it is in the village of Garrovillas de Alconétar, in the National highway 630 in the kilometric point 519,5. 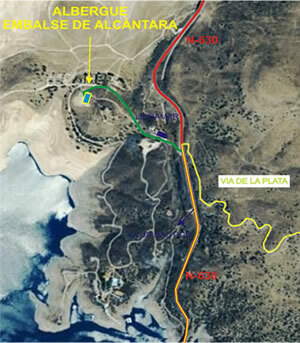 You access easily from the highway N-630 going down 500 meters for a Roman roadway belonging to the Via de la Plata in address to the Reservoir of Alcántara. A) Exit of Cañaveral: take N-630 in address Cáceres and to about 9 kms from Cañaveral turn right passed the crossing with Coria (EX-109). B) Exit of Hinojal: take N-630 and past the Nautical Club turn to the left. It is necessary to lower 500 m. for a road that is the Roman roadway of the Vía de la Plata. The Housing is 35 kilometers of Cáceres, 35 kilometers of Coria, 49 kilometers of Plasencia, 79 kilometers of Trujillo, 97 kilometers of Navalmoral de la Mata, 123 kilometers of Badajoz and 106 kilometers of Mérida.